Head lice has been a persistent problem since the creation of man. Lice is mentioned in the Bible’s Book of Exodus and nits (lice eggs) were even found on mummies in ancient Egyptian pyramids! Head lice will continue to be a cause of shame and anxiety until we dispel all the myths and learn the basic facts about these tiny pests. 1. Lice are NOT more common in dirty hair. Lice don’t care if your hair is clean or dirty, blond, brown, or covered in hair products. Head lice are only interested in blood. Anyone with blood pumping through their veins is at risk for head lice. 2. Lice are NOT more common in dirty homes. Lice can only survive while attached to someone’s head. Whether your home is clean or untidy makes no difference. 3. You do NOT need to clean your entire house upon being diagnosed with head lice. Lice can’t survive once they are away from your head, so only things touched within the previous 24 hours need to be treated. 4. Your pet CANNOT get lice or give you lice. Period. 5. Shaving your child’s head is NOT the only way to rid your family of lice. There are many safe and effective methods available that won’t harm your child’s self-esteem anymore than does the diagnosis of head lice. 6. Contrary to popular belief, sharing hats, brushes, clothes, helmets, etc. is NOT how most cases of head lice are spread. Research shows that 98% of all head lice cases are caused by direct head-to-head contact. 7. A nit that has been picked off your hair CANNOT hatch. It will die immediately. For the same reason chickens sit on their eggs, nits need the warmth of our head to survive and hatch. 8. Lice CANNOT jump or fly from head to head. 9. 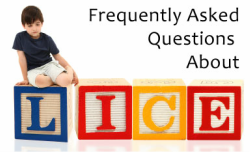 There is no “lice season.” Unfortunately, lice happens year round. The important thing is to be vigilant in ensuring it is caught early and treated properly. 10. If lice is found, change your sheets, towels, and the clothes you wore from the day of diagnosis. If your child slept with a stuffed animal or used a comforter, put those items in a dryer on HIGH for 20-30 minutes. If he/she slept on a couch, simply place a sheet over it and stay away from it for 24 hours. 11. Putting hair in a pony tail or bun, and using a mint spritz is the best way to prevent your child from getting lice. 12. The most effective way to rid yourself or your child of lice is a good nit comb. We also encourage you to look for safe, non-toxic products, such as those offered on this site. 13. Finally, if your family is battling lice chances are you’re wondering who gave it to you. While that’s important to prevent re-infestation, it’s equally important that you consider whom you might have given it to. As the leading lice expert in the United States says, “Be a friend, tell a friend.” Otherwise, this unwelcome cycle will continue.